The Jeep legend began in November 1940, in the early days of World War II, just a year before the United States entered the war. A small, four-wheel drive prototype, the Willys "Quad", was delivered to the US Army. It featured the Willys "Go-Devil" engine, developed by Delmar "Barney" Roos. With 60 horsepower and 105 foot-pounds of torque it not only exceeded the Army's requirement, but dwarfed the Bantam's 83 and Ford's 85 pound-feet of torque, it's only competitors for the military contract. The Quad was the father of the MB, CJ series, and Wrangler. 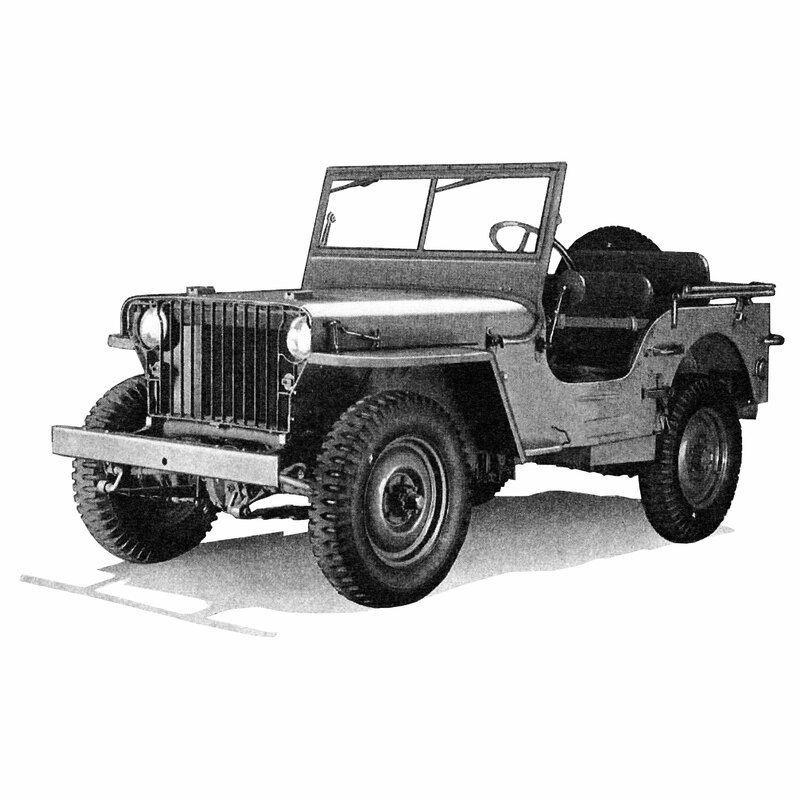 Willys refined the Quad and built 1,500 units of the Willys MA model, many of which were used in WWII. From 1941 to 1945 Willys produced the MB model, the original go-anywhere, do-anything vehicle, which came to be known by its nickname, "Jeep". Made famous during WWII, Willys produced over 300,000 MB vehicles. 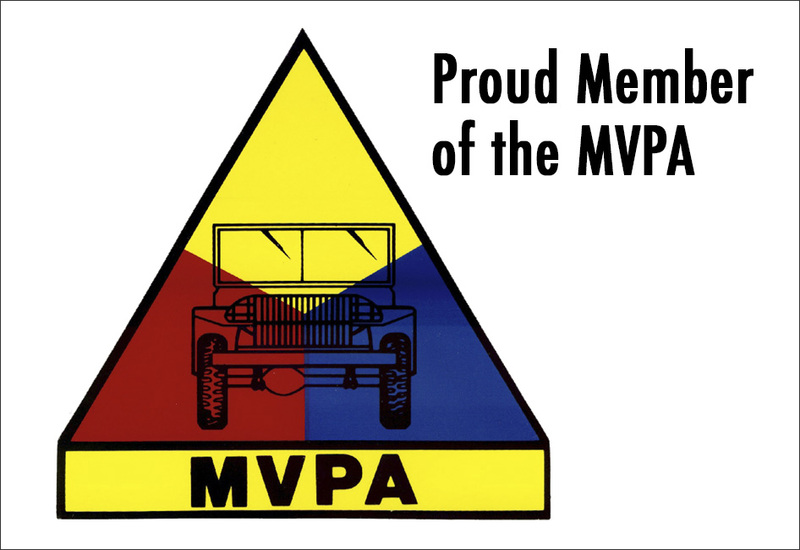 Jeeps were heavily used by every division of the American military, with 144 Jeeps provided to every infantry regiment in the U.S. Army. Large numbers of Jeeps were shipped to the Allied Forces of Britain and Russia: nearly 30% of total Jeep production. The MB evolved into the M-38 military model, which featured a waterproof ignition system and was built from 1950 to 1951 specifically for use during the Korean War. During that conflict, Willy redesigned the M-38 and it became the M-38A1 with a longer wheelbase, softer ride, a more powerful engine and a new, more rounded body style. In production through 1962, during that time Willys also produced the M-170, which was designed to be fitted with several different body packages. One was a light troop carrier. Because passengers were somewhat enclosed compared to earlier models, the M-170 was also used as a field ambulance. 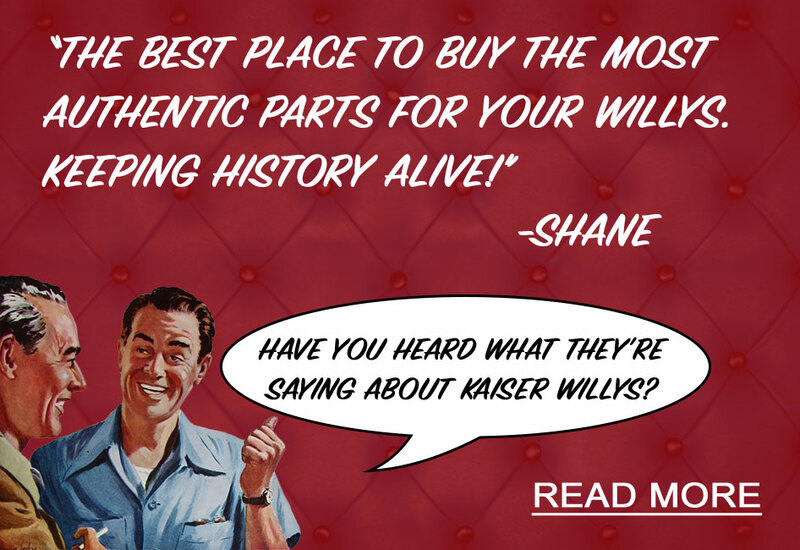 Kaiser Willys Auto Supply has old Jeep parts for all Willys military Jeep models. At the close of World War II, Willys realized that it could leverage its wartime fame and enter the consumer vehicle market under an already well-known brand name. The first "civilian" Jeep was the CJ-2A, also known as the "Universal". It offered features not found on the military MB model, including a tailgate, side-mounted spare tire, higher windshield and larger headlights. The retail price was $1,090 and the CJ-2A was produced from 1945 to 1949. The CJ series evolved rapidly, first as the CJ-3A (1948 - 1953), with improved ventilation and a one-piece windshield that featured wipers at the bottom as opposed to mounted in the top frame. The CJ-3B (1953 to 1965) had a higher hood to accommodate the more powerful "Hurricane" overhead-valve four-cylinder engine. During the CJ-3B production run, Willys also offered the DJ-3A, or "Dispatcher", a two-wheel drive version of the CJ-3A that was available in hardtop, convertible, and half- and full-top models. It was often used as a vacation rental vehicle at tropical resort destinations. Kaiser Willys Auto Supply has old Jeep parts for all Willys CJ Jeep models. From 1955 to 1983, the CJ-5 was a popular model, with special versions including the Jeep Camper, 462, Renegade, Super Jeep, Golden Eagle and Tuxedo Park. A two-wheel drive version, the DJ-5, was offered through 1974. Overlapping with the CJ-5 model was the CJ-6, which had a stretched 20" longer wheelbase. A two-wheel drive version was called the DJ-6. Read more about the CJ-5 and CJ-6 Universal Models. Moving closer to modern Jeeps, the CJ-7 was introduced in 1976 and had a very successful 10-year run. With a wheelbase 10" shorter than the CJ-6, this was the best handling and smoothest riding CJ ever, and it's still popular today. An open cap pickup version called the CJ-8, or Scrambler, was built at the same time and was 10" longer than the CJ-7 (meaning it had the same wheelbase as the CJ-6). Both soft tops and hard tops were available for the CJ-8. Kaiser Willys Auto Supply has old Jeep parts for the entire Jeep CJ series. Willys Trucks and Station Wagons and the Jeepster Models are not nearly as well known as the ubiquitous and familiar "Jeep". But in fact Willys made a number of different truck models, including the 6-226 truck with an open rear bed (an early "pickup"), the Forward Control model FC-150 and the 6-226 4x4 station wagon. 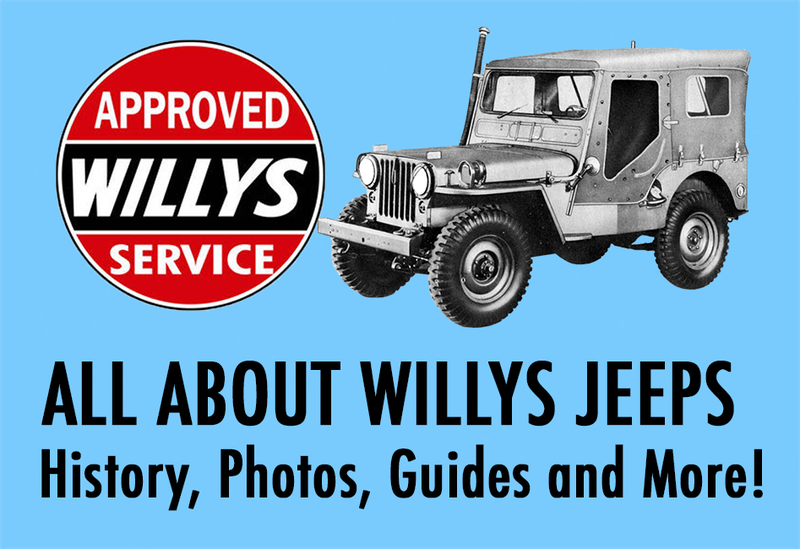 Read more about Willys trucks.